Kabukiza Theater in Kobiki-cho, Kyobashi-ku (Ginza, Chuo-ku) in Tokyo. 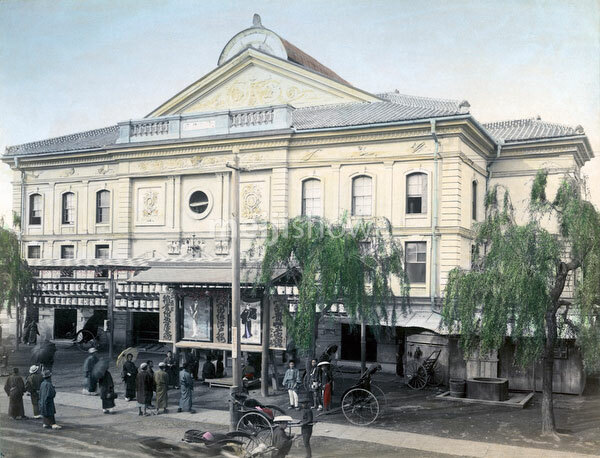 This theater for kabuki performances was established in 1889 (Meiji 22) by journalist, critic, author and politician Genichiro Fukuchi (福地源一郎, 1841-1906). The building in this image was replaced in 1911 (Meiji 44) after it burned down due to an electrical fire. This structure was destroyed by fire in 1921 (Taisho 10), after which a new building was built in baroque Japanese revivalist style. This was demolished in 2010 (Heisei 22) to make way for a larger modern structure. The theater has been run by the Shochiku Corporation (松竹株式会社 ) since 1914 (Taisho 3).